Epiphany is celebrated in different ways among the various denominations. As Anglicans we celebrate not only the event commemorated on Epiphany Day, the Visit of the Wise Men, but also six other “manifestations” of Jesus Christ to the broader Gentile world. These six are the Teaching the Wise Men in the Temple (First Sunday After Epiphany); the Baptism of Christ (Second Sunday After Epiphany); the Wedding at Cana, including the first miracle of turning water into wine (Third Sunday After Epiphany); the twin healings of the Leper and the Centurion’s Son (Fourth Sunday After Epiphany); the Parable of the Wheat and the Tares, concerning the “harvesting” of the faithful at the coming of Judgment (Fifth Sunday After Epiphany); and Judgment at the Second Coming (Sixth Sunday After Epiphany). Among Eastern Orthodox Christians it is the Baptism of Christ that is the central event. In years when Easter is early and Epiphany season is shortened, the readings for the Fifth and Sixth Sundays After Epiphany are used as the final readings for Trinity season. These fit nicely as a transition to the Penitential season of Advent, celebrating both His Nativity and His Second Coming. Epiphany is not a Scriptural word. It is derived from several Greek words, all meaning to show forth or shine forth and from the Greek word for light. In the first three centuries of the Church, Epiphany was part of the Nativity feast, being the day after the Twelfth Day of Christmas (Epiphany Eve). Around the time of Roman Pope Gregory the Great (440-461 A.D,), the Feast had become a celebration of the visit of the Wise Men, or Maji, thus the name Adoration of the Maji for the Feast. The illustration is a modern photograph of a raised relief carving, most likely somewhere in central or eastern Europe. 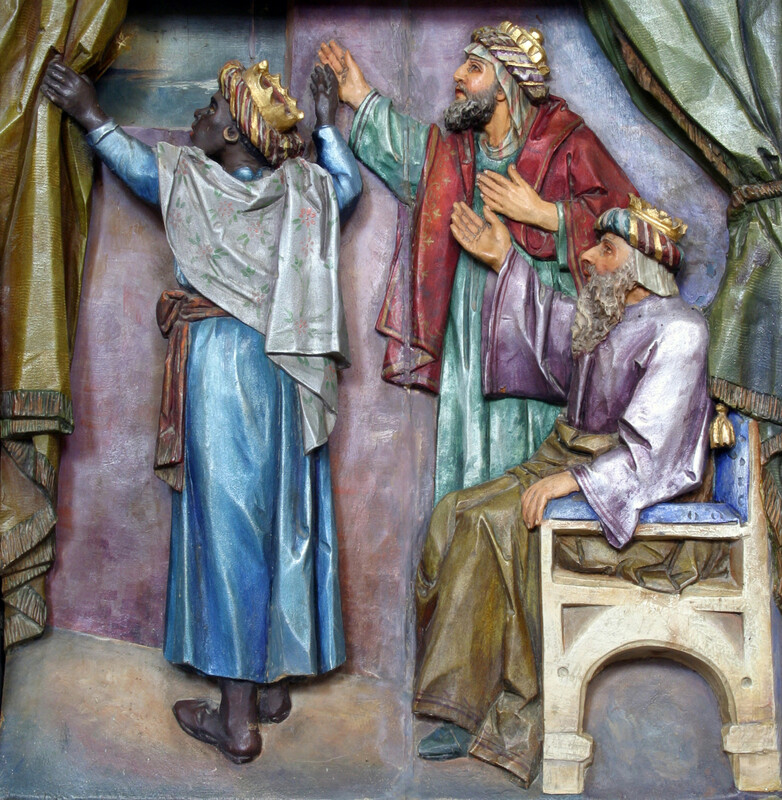 Note that the three figures are displayed according to the Roman Catholic doctrine that they represent the three races of mankind, the European, the Asian and the African, an idea developed about the same time that the Roman Church fixed the number of wise men at three and gave them names: Caspar (or Gaspard in Anglican usage), Balthazar and Mechior. The Book of Common Prayer readings for Epiphany, January 6th, are St. Paul’s epistle to the Ephesians (Ephesians 3:1-12), in which the Apostle to the Gentiles, explains that the Gentiles have the same access to the salvation promised by Jesus Christ, and St. Matthew’s account (Matthew 2:1-12) of the encounter between Herod and the wise men, the wise men’s visit to the Holy Family and their “worship” of the Child/King, and their return to “their own country” without informing Herod of the Child’s whereabouts. This year the AIC website will host a Podcast Homily for Epiphany (January 6th) and all six of the Sundays After Epiphany, whether or not they are actually read in services this year. These will be available on the new Podcast Homily page at the AIC web site. These seven homilies will focus upon the designated Prayer Book readings for each of the Sundays, with a focus on how they relate to traditional Apostolic teaching. May God bless each of you with a happy and prosperous New Year in A.D. 2015.